Z-Ultimate Self Defense Studios is proud to offer our Ultimate Kenpo Karate System in a variety of age-specific formats. One of the things that makes Z-Ultimate unique – besides our World Class Personalized Instruction – is that we do NOT mix all ages and skill levels in our training programs like many other schools. We separate our programs by ages and skill levels to make sure you or your child is being trained in the most effective way based on age and ability. Our programs offer classes for students of all ages and skill levels – from white belt to Master-level Black Belt, from as young as age three to grandparents in their sixties and seventies – all taught in safe, clean, family-friendly environments. One of the best things about our training is that it is one of the few activities the entire family can participate in and grow together. With our age-specific programs, your whole family can be learning and be enjoying the benefits of a martial arts classes while training with other students their age and skill level. Self defense classes for kids are NOT about just punching and kicking – they are about developing happy, healthy, resilient good citizens. 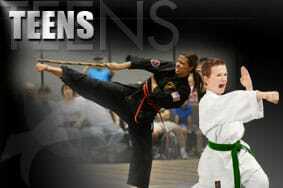 We take our Ultimate Kenpo style and use it as a tool to empower your child physically, mentally and emotionally. Our program improves focus, self discipline, self esteem, listening skills, coordination, physical conditioning, flexibility, balance and more. From learning how to deal with setbacks, learning how to compete and be your best to how to deal with bullies and conflict resolution, our Kids Program teaches your child how to be his or her best each and every day, no matter what. As many parents of teens know, the teenage years can be some of the most rewarding and most challenging. Our program offers a safe, structured environment that provides support, guidance and clear guidelines as your young adult matures. Your teen will develop a healthier self image, stronger self esteem and enhanced social skills. Through martial arts training, your teen will also learn guiding principles like consequences of actions, hard work and dedication, decision making and how to interact with others. Our program can help shape your teen’s future by providing a solid foundation for success. What makes our training for adults unique is the Mind-Body-Spirit approach that addresses every aspect of personal development. Regardless of age or ability, training in the martial arts can help any adult realize their “Ultimate” Self. Whether you are interested in getting in better shape, learning to defend yourself or just getting involved in something new, the benefits you get from our are far more than just learning how to punch and kick. Men and women of all ages have discovered that self defense training opens doors for mental, physical and emotional empowerment that they never realized. Earning your Black Belt in Ultimate Kenpo is not about the belt itself – it is about the journey. 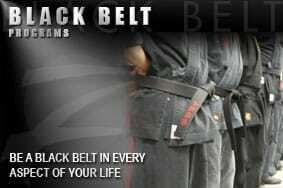 There is a very small percentage of martial artists in the world that can say they have earned the title of “Black Belt”. The students who have done it will tell you that the day they earned their Black Belts was one of the most challenging, memorable and important days in their lives. There is something about achieving a goal and pushing yourself to go beyond what you thought you were capable of that changes you forever. It is also a feeling that is almost indescribable. Almost everyone can earn a Black Belt – but not everyone has what it takes to earn one.